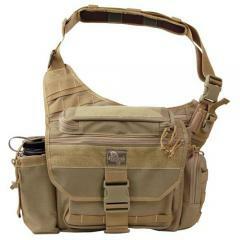 Maxpedition 0439K, 0439B Mongo Versipack FREE SHIPPING! Be prepared to go distance with Maxpedition's Mongo Versipack. The new and improved extra-large pack offers more space, more versatility and more features which means more ways to get the job done. A huge main compartment features a slip pocket and drawstring storm to collar for secure item storage that stays protected even under inclement conditions. Two side pockets along with two front pockets have loop fields for securing additional gear and accessories. The lid also doubles as a pocket that protects gear and provides quick access to frequently used items. A heavy duty buckle keeps the lid secured so nothing leaves the pack by mistake. The hidden rear sleeve is designed especially for tactical operatives and provides a discreet space for concealed weapon carry. Dual loop panels lining the sleeve's interior are ideal for securing a holster and also protect firearms from scratches. Both the shoulder and waist straps remove in order to provide versatile carry options. Maxpedition products are always first rate. I just want a bit larger bag for a car carry bag and this was perfect. All good, except I feel that the flap cover should have small end flaps to cover the main center compartment to keep out dust, moisture, etc. Also, the new top handle should be wider for stronger and better grip. I have been using a Jumbo Versipack for a couple years now as my Geocaching bag, and it has worked really well. I decided that I needed something a little bigger to carry as an EDC bag that could accommodate my tablet, as well as the things I like to have with me on a day to day basis and the Mongo fits the bill perfectly. Same great Maxpedition ruggedness with a little more room. The Mongo Versipack is a great bag and Cops Plus is the place to buy it. ©2002-2019 CopsPlus.com: Maxpedition 0439K, 0439B Mongo Versipack FREE SHIPPING!